By Jonathan Crean | March 6, 2012. 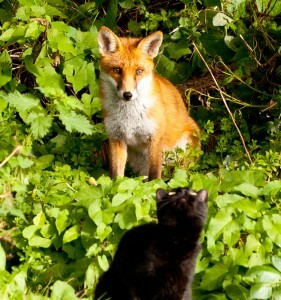 Liberties residents have expressed concern in recent weeks at a rise in urban fox sightings. Red foxes have adapted well to city life, using opportunistic tactics to survive. The most recent study conducted by Dublin City Council has found an average density of one fox family per square kilometre, though some areas have four to five times this density. This time of year sees a peak in urban fox activity, however. “There was this fox with a death-wish and no traffic sense bounding about Camden Street,” local resident Chris Ledsham said, recalling his encounter with an urban fox. Residents say local hotspots include Camden Street, Lennox Street, Thomas Court and the Sally’s Bridge area. Mr Wall says people usually have mixed views about the animal. Irish Wildlife Trust spokesperson, Joanne Pender, said urban foxes pose no threat to people. “They generally don’t confront humans. They’re really a lovely animal, they’re rarely vicious,” she said. Stephen Heron (steve-h) on Flickr.